Last month, based on back to back selling climaxes and sentiment declines, Investors Intelligence moved from 100% cash to 80% long. That was an accurate call as September went on to register a strong and unseasonal 8.8% gain. As a result, Investors Intelligence is recommending going back into cash and taking selective short positions. If you don’t recognize the terminology, a buying climax is when a stock trades above its 52-week high only to close below it (for that particular week). And for selling climaxes, when a stock trades below its 52-week low and closes above it. I don’t think the buying/selling climax ratios are at an extreme here. You can clearly see on the chart that we’ve seen some truly lopsided episodes such as April/May 2010 and January 2010. 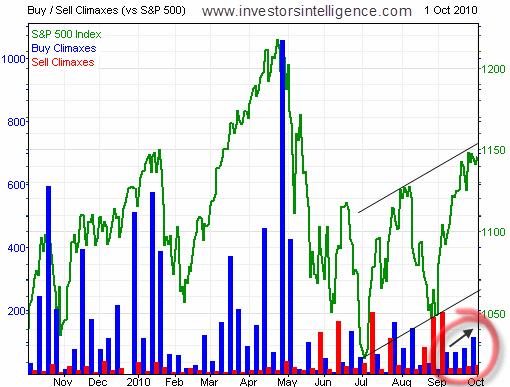 What is clear is that the market environment which favored the bulls just last month is now neutral to negative. As we discussed yesterday, market breadth is now decidedly too thin for a continuation of the run we saw during September. As well, the sentiment is shifting towards more and more bulls. For example, the latest bull ratio for Investors Intelligence sentiment survey of newsletter editors is now at 62%. This means, of those that are decided, 62% are bullish - the highest level since late May. Another measure of growing bullish sentiment is the option market. According to the ISE sentiment index, the 10 day average (equity only) call put ratio is at 195. This means that for the past two trading weeks, on average we’ve seen almost twice as many calls being bought to initiate a position as puts. I’ll have more in depth coverage in the weekly sentiment overview on Friday. The only conflicting analysis is the seasonality tendency that shows when September does the opposite of what it is supposed to do, that momentum is carried forward for a few more months. Wayne Whaley (CTA) has shown that when September is positive, the S&P 500 index is positive for the 4th quarter 84.6% of the time with an average return of 4.93%. This is more than twice the normal 4th quarter return (2%). Interestingly enough, previous positive Septembers have canceled out any October crashes. Keep in mind though that, just as we’ve seen with September bucking the seasonality trend, there is no reason why the market has to follow a certain path. Even if that path has been used many times before and is well worn. You set a nice table, Babak. Thanks always for bringing all this well-analyzed data into clear light and close proximity– leaving us to draw our conclusions even as you draw your own. I think much of the seasonal weakness of Sept. and into October has to do with many Mutual Fund fiscal years ending Oct.31; this means there is always SELLING which occurs for tax reasons, and not nec’ly pure investment reasons. The weaker the year, the more the urge to capture offset losses and play shrewd games. Since selling always begets selling, by its nature, much of the logic of a summer/autumn seasonal effect derives from this… meaning that by looking at what kind of year has gone by, one can roughly guess where the tax-selling incentives will lay and in which sectors. In a purely “investment” universe there would be no calendar, and all actions would be just fundamental or technical in nature. The calendar introduces extraneous elements, perturbates the existing complex ‘organic’ market waveforms and patterns with simple human psychology. No End of Quarter– no ‘window dressing’, etc.